Bauer College MS Accountancy candidate Martiza Rodriguez was recognized as one of the best in the greater Houston/Galveston region by the Financial Executives International (FEI) Houston Chapter Scholarship Foundation, receiving a $5,000 scholarship for the academic year. A leading local professional executive association recently recognized a Bauer College graduate accounting student as one of the best in the greater Houston/Galveston region. MS Accountancy candidate Martiza Rodriguez has earned a $5,000 scholarship for the upcoming academic year from the Houston chapter of Financial Executives International (FEI). Rodriguez is one of only 12 students in the area to receive the honor. The FEI Houston Chapter Scholarship Foundation provides financial support to outstanding accounting and finance students in Houston and Galveston and the surrounding regions. For Rodriguez, the scholarship will provide the opportunity to focus on her studies and student activities. 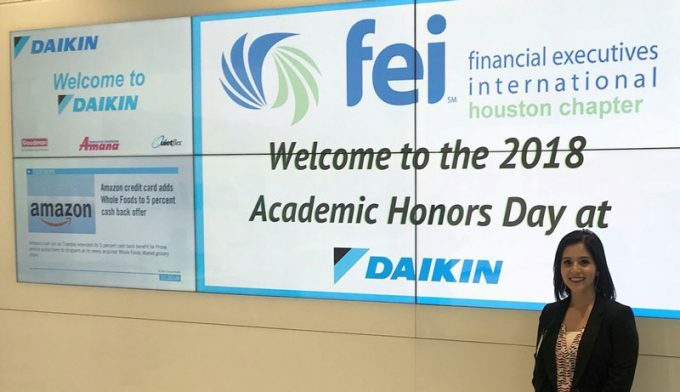 As one of FEI – Houston’s student honorees, Rodriguez also had the opportunity to participate in an Academic Honors Day with a panel of industry experts, where Bauer clinical assistant professor Mohan Kuruvilla provided support and helped to recognize her achievements. Bauer faculty and staff, along with student organizations like the Internal Audit Student Association, make the college’s MSACCY program an unparalleled experience, Rodriguez said.